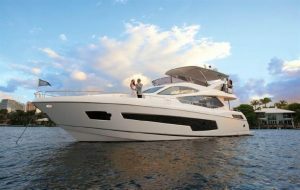 Be sure to come by and see this Palm Beach Boat Show Sunseeker! : Atlantic Yacht & Ship, Inc.
Stephen Faraldo has listed a brand-new 75′ Palm Beach Boat Show Sunseeker 2017 yacht for sale in Florida. In the first place, this 75′ Palm Beach Boat Show Sunseeker 2017 is fresh off the ship. Not to mention all the upgrades and features she has. In fact, this yacht is a fusion of style and sophistication that will not fail to impress. Overall, she has three decks which have modern and spacious layouts. Similarly, on the main deck, the signature z-shaped windows allow plenty of natural light. This illuminates both the dining and separate seating area. In addition there is a whole lower deck! In summary, the lower deck on this 75’Palm Beach Boat Show Sunseeker 2017 has four cabins. This includes three double cabins and one with twin berths. In total you are able to sleep eight guests. Back outside, the vast outdoor playground was made for entertaining. Complete with wet bar, sun pads, and dining area. It’s the perfect place for relaxing or enjoying thrills alike. Furthermore, with the ability to cruise at 34 knots she proves sometimes you can have it all! For more information on this new 75′ Palm Beach Boat Show Sunseeker yacht for sale contact Stephen Faraldo today!